Sermon preached by Rev’d Dr Emma Pennington at All Saints’ Cuddesdon on All Saints’ Sunday. Readings: Revelation 21: 1-6a, John 11: 32-44. We are very fortunate to have some amazing stained glass within the three churches of our benefice. 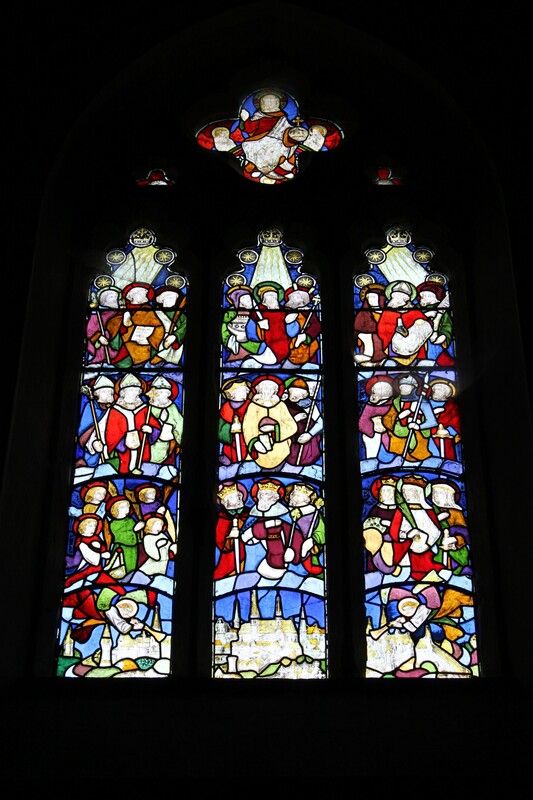 I have my favourites in each but in this church of All Saints’ it is window at the west end that I love. It shows a depiction of the heavenly city, which shows a remarkable resemblance to the city of Oxford. Above the towers and steeples the ranks of the holy ones rise from townsfolk, to bishops, to holy virgins, to martyrs, saints, apostles, and finally, seated upon his rainbow of light is Christ in majesty. Sometimes, as the sun is setting in these late autumn days, its rays will pierce through this window and cast its colours upon the pillars of the church. As we enter the dark days of winter, November is the time of year when to turn our eyes heavenward and contemplate the great ‘cloud of witnesses’ that dwell in perpetual light. The feast of All Saints traditionally began on All Hallows Eve or Halloween when poor folk would go round asking for food in exchange for prayers for the dead and pumpkins were put out as reminder of those souls who were in purgatory. Today it has become an opportunity for children to dress up as their favourite witch or wizard and go to discos or head out into the dark on the hunt for sweets. For some the fun of Halloween belies a sinister celebration of evil. However, as a parent of children who woke in the witching hour of night with dreams of monsters and evil, Halloween helps to shine a light and dispel the fear which lies at the darkest recesses of the human mind. It is interesting that whilst few of us would believe in the object reality of the devil and demons in our rational and scientific world, Gothic fantasy is alive and well. It is a truism that we do not truly know or appreciate light unless we also experience darkness. From the darkness of Halloween, the light of All Saints flickers forth as hope. On the 1st November we turn from evil to righteousness and those who dwell in the light of Christ. 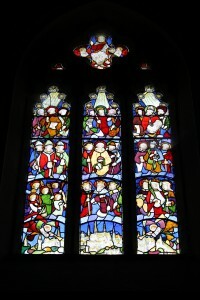 The windows of our churches shine down their names and faces: St Benedict, St John, Mary, St Gregory, Bede and so forth. To us who are still struggling with the toils and cares of this world, they can seem so smug and unhelpful. How on earth can I be like one of them? And yet when we turn to the stories of their lives we find a rather odd and at times ordinary bunch of people, what made them extraordinary is the extent to which they allowed the light of Christ to shine in and through their lives. Being shot through with this light did not necessarily mean they lead lives of comfort and security, often it lead to suffering and sacrifice. Yet to them these were nothing compared with the light and love of God which consumed them and burst out to illuminate and sanctify the world. They stand in our windows now, not as judgements on how we live our lives but as beacons which point us to this light and remind us of our own calling to sainthood. But how, how are we to become saints like Francis or Giles who clearly and dramatically let the light through their lives. Well, if to be a saint is to be like a window who lets the light of Christ shine into the world, then in a sense we are already saints. Because it is the very nature of a window to let light in. A window is made and designed so as to illuminate a room or a church. Therefore it cannot do anything else but allow light to shine through. In the same way, we, by our very nature, are made in the image and likeness of God and cannot but reveal something of God in ourselves. But, unlike a window, who cannot do anything but be a window, we can distort and obscure our true natures. We can pull down the shutters or draw the curtains shutting God out of our lives and stopping his light from illuminating the world. So to be saints we need to firstly recognise that this is who we truly are, saints. People who are created to be filled with God’s light and to shine out in the world. It is then our task to open the shutters and let God into our lives, to draw back the curtains and let the light into the world. We all know what this opening up is like. We have all confirmed our baptismal vows and felt the joy and wonder of God’s spirit within us. Remember that calling and allow God to shine in and through your life by keeping yourselves open to God through prayer, worship and love. Then like St John, St Peter, St Mary and St Martha and all the saints we who are ordinary will be made extra-ordinary through the work God will and does do in us. This work may not be grand, we may not be asked to become a living sign of our need for God like Francis, but in our own unique way and with all our faults, God will illuminate us and use us. At the retreat centre in Lille where I stayed once, there is an amazing chapel. It is incredible because its windows are made up on lots of squares of glass but only in three colours: yellow, red and black. Most of the window is filled with black squares and only a few with the other colours. Every now and then there is a pure white square of glass through which all the light seemed to squeeze through. We are all called to let the light through, but we know that we are not plain, clear glass. We are made up of lots of bits of glass some clear and white, some coloured and many dark. But however we are God’s light still shines through. We do not need to be a perfect, clean, clear window for us to be and live lives which let the light through. God fills us and uses us as we are and shines into and through our coloured and dark selves slowly penetrating them with his light. From sitting in that chapel in Lille and looking at those windows for a long time, I realised that all the patches of colour and light in them were different for each window. I began to wonder if all the windows were placed one infront of another whether they would make up one clear white window through which all the light would flood into the chapel. Each of us has little squares of light, areas of gifts and grace that are ours alone and through which God can be clearly seen. Apart, the vision we reveal of God is patchy and small, but together we let God’s light most fully shine in us and through us to this dark world. So on this Feast of All Saints remember and rejoice that we are called to be saints and to find our place in that great cloud of witnesses where we may delight in God’s light in ourselves and each other and truly let that light shine out into the world. Amen.